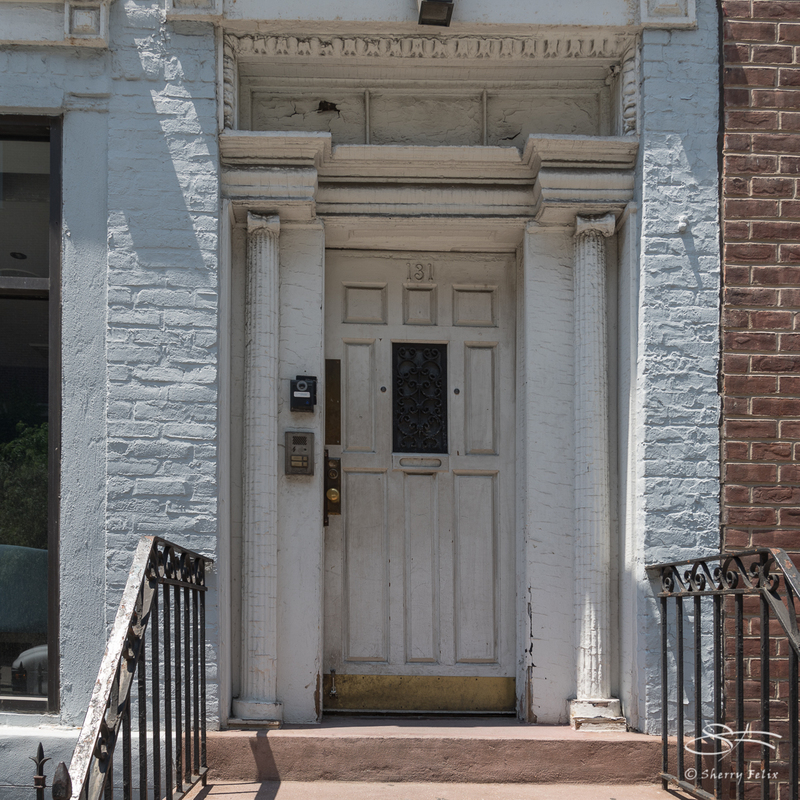 129 MacDougal Street in Greenwich Village is one of four rowhouses (Nos. 125-131) built on lots owned by Alonzo Alwyn Alvord, a downtown hat merchant. The area around Washington Square (converted from a potter’s field in 1826-28) was an elite residential enclave. This 2-1/2-story Federal style house was constructed c. 1828-29, has Flemish bond brickwork (now painted), low stoop with wrought ironwork (the newel post is topped with a pineapple), the doorway has Ionic columns, entablature and transom, molded lintels with end blocks, peaked roof, molded cornice, and pedimented double dormers (lots of fancy words to look up). This house, and its neighbors, is among the relatively rare surviving Manhattan buildings of the Federal style. It was owned by and leased by members of the merchant class until later in the19th century the neighborhood became less fashionable and 129 became a lodging house. In the 1910’s this block of MacDougal Street became a cultural and social center of bohemian Greenwich Village. 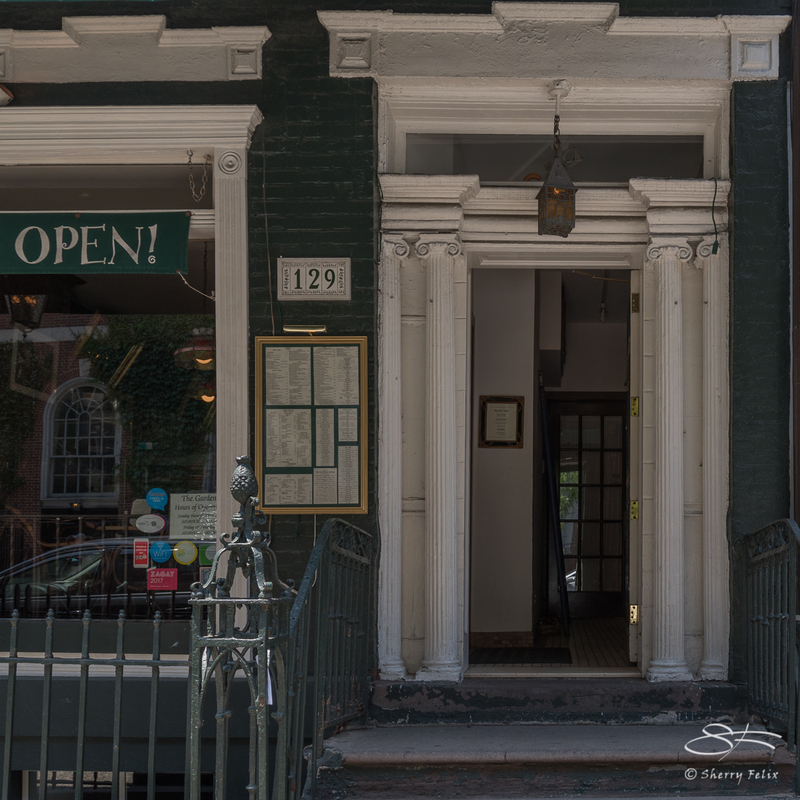 129 is a cafe, La Lanterna, and we often stop there after one of Marc’s history tours of Greenwich Village. They showed us the basement, which has an old wine cellar and a secret tunnel. Oh my goodness you know your architecture!! Lovely photos and great history, too. This looks such an interesting place to visit. It is full of history. We keep learning more. Thanks. I like that part too.